Home auctions can be scheduled for any number of reasons. The government has seized the home for failure to pay taxes, the home was seized as part of a seizure of property related to a crime, it’s up for auction as part of a foreclosure, or maybe simply the previous owner is elderly, has moved out and the home and its contents are up for auction because they don’t want to deal with it anymore. Whatever the reason the home is up for auction, you can trust Front Door Title to provide honest, affordable and quick title services. Whether you are an individual or a real estate investor, if you need us to run a title search (abstract) on one or more home auctions, we can. Simply give us a call at 410-870-7070 to get the process started. 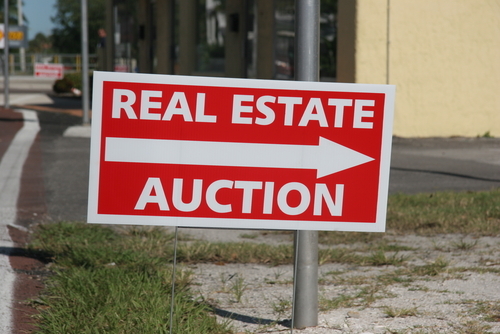 It may be unwise to purchase a property at auction without knowing its title history, as there can be some nasty surprises, such as liens, unknown heirs who claim to own the property, fraud or forgery in a deed, etc. A title search will reveal those issues, so you know what you’re getting into before you decide if you want to purchase the property. If you do decide to purchase property at home auctions, Front Door Title can resolve title issues for you, and issue you owner’s title insurance. Many homes are auctioned for cash, but if you have a lender involved, we can also issue the required lender’s title insurance policy. If you are purchasing the home as an investment, and plan renovations before you re-sell it, your buyer may want to consider using us as the title company at closing. Since we are already familiar with the property and have run a recent title search, we may be able to offer them a lower rate, called a re-issue rate, on their owner’s title insurance.